The ESOMAR Council meets four times a year, three times in Amsterdam and once at the ESOMAR Congress. We would love to meet more often, but the costs would be too much. Between our face-to-face meetings we have a teleconference, and the first teleconference of the year happened last week. Here are the key updates from that meeting, plus some general updates. North America accounts for almost 50% of global market research revenue, which is why ESOMAR has been working to improve the services it can offer to the region and to ensure that North Americans constitute a larger part of the growing total membership of ESOMAR. As part of ESOMAR’s focus on North America, Reg Baker has been appointed as ESOMAR ambassador in North America. One of the first areas where ESOMAR has been able to help is in Canada. Last year MRIA (the Canadian research organisation) folded and since then a coalition of Canadian companies have created a new organisation, CRIC (the Canadian Research Insights Council). ESOMAR has been offering whatever support it can to this new organisation. Lucy Davison presented a report on the role of the ESOMAR Reps. The Reps are volunteers and they are the local face of ESOMAR around the world and Lucy is leading an initiative to help the Reps be more effective. The initiative will include more support, more sharing of ideas, and better monitoring of best practice, focusing on sharing the ideas from the most successful reps.
Joaquim Bretcha is leading a group that is looking at how to build bridges to the world of data science. ESOMAR seeks to ensure that customer-focused data science is seen as part of the wider market research world. Many of the data scientists are interested in working with ESOMAR because we are further ahead than most organisation in terms of data privacy and GDPR in particular. Joaquim has had several meetings and more are planned. Along with Umesh Kumar I am looking into the needs and opportunities related to the organisations that supply products and services to the market research industry, for example panel providers, software platforms, recruitment etc. At present this group constitute just 6% of the total ESOAMR membership, but they are the most important group in terms of sponsoring conferences and online content. Two interesting, important and related questions are ‘What types of companies fall into this category?’ and ‘How big is this category?’ These two questions lead to the question about whether more than 6% of ESOMAR members should be drawn from the suppliers to the research industry? To explore this topic further Umesh and I will be organising a survey, which will look at the needs of this group and their perception of the options ESOMAR offers – more news soon. Amongst many of the people who work with the ESOMAR Council there is a feeling that the current term of office (two years) is too short. Given the Council only meets four times a year, it means projects need to go from idea, to action, to implementation across a period of just eight meetings. There have been discussions in the past about making the term of office three years or four, years or making the term of office for the President and Vice-President. Niels Schillewaert, the immediate past-President of ESOMAR, is leading an investigation into changes. If there are to be changes, they need to be voted on at this year’s ESOMAR Congress in Edinburgh, in order that the 2020 elections could be held using the new rules. I would love to hear people’s thoughts on this topic? What do you see as the main benefits and the main negatives of making the terms of office longer? The new ESOMAR President Joaquim Bretcha has adopted a metaphor of building bridges. For example, building bridges between practices, between trade associations, between countries and between generations. At the recent Festival of #NewMR Ray Poynter interviewed Joaquim Bretcha about his vision for ESOMAR, you can see a recording of the interview by clicking here. 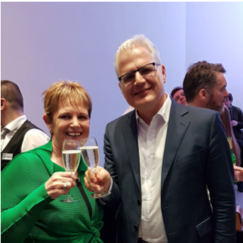 President Joaquim Bretcha has been keen to build bridges with other organisation and in the last month has attended the MRS IMPACT Conference and Quirks events in London – with ESOMAR helping sponsor drinks receptions. Joaquim is keen to build better bridges between the associations and we are delighted to announce that MRS CEO Jane Frost CBE will be speaking at this year’s ESOMAR Congress in Edinburgh. The future for market research needs to draw an all the research bodies, working in agreement, to help shape the outcomes. Thank you for your support of market research in Canada and CRIC (the Canadian Research Insights Council).